Build this example using an LCD with a serial backpack, like this one from Adafruit, or this one from Sparkfun for inexpensive wireless text output. It’s the fastest way for your project to gain human communications! Now you can create a Twitter display for your office door, prototype a quiz game toy that teaches math, or add interactive instructions to your automated greenhouse watering system. 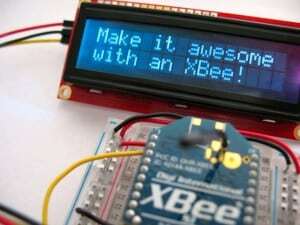 This LCD-enabled XBee is a great way to make the things you make talk to people! Hello ! I am using an ATMEGA16 for UART transmission of data via X-CTU and showing the typed characters on an LCD. But it displays garbage value even when i donot send it anything. Kindly guide me about it. Check to make sure you’re on your own PAN ID, if you are using the Series 1 802.15.4 radios. i m using explorer on PC side and other xbee is connected to my hardware (i.e. arduino). i have updated firmware of PC xbee to XB24-ZB as “coordinator AT” and the other one has updated firmware with XB24-ZB as “ROUTER AT”. how do i check my pc is discovering a network or not..? I am doing a project in which I want to receieve signal from wifi and display it on lcd screen. I dont know how to make it.PLease guide.